Rejuvenate yourself with body massage by senior male therapists at the comfort of your home. 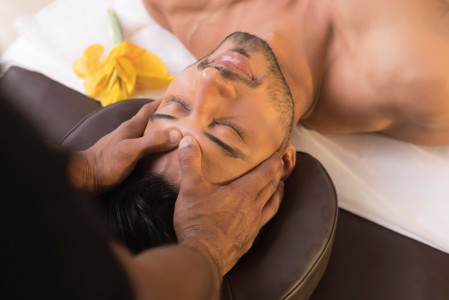 We offer services like foot reflexology, swedish massage, deep tissue massage for men by 4.5 rated male spa therapists with 5 years + experience near you in Delhi. We provide you with trained & experienced male therapists who are hygiene friendly. They will recreate spa experience at home and it includes massage bed,oils, etc. To de-stress yourself book full body massage at home now at UrbanClap! Very well mannered and helpful. Focussed on specific areas i had pointed out as stress prone. He also did check more than once on the pressure to be applied. In the leg area, you should go top to bottom with the massage stroke, and not bottom to top, as that is against the natural direction of hair. So the massage in the legs wasnt relaxing. therapist is highly skilled and provides an excellent massage. Very relaxing !!! Sad to say that I had wasted money. He is very friendly and manageable person. He did his job very sincearly and acctievely. This is the second time in a row that I have taken massage from him. And yet again he was awesome with his work. Best of luck. Too relaxing it was. Thankyou Amit. Excellent massage therapist liked the work. Would recommend him for further massage services through urban clap. Jared is a good masseur and knows his job well. I am busy Professional Whenever I book for massage service & Choose/Give time pls do not pre -Confirm about the given time by calling frequently before the time as i am mostly busy & Keep my cell on Silent No.Pls Reg My cell no 9654006423 . He knows his job and understand the pressure points. Excellent massage. It was a very very long session but he worked on the stress points very well. Also included elements of Thai massage and physio which was fantastic. With hectic work schedules and busy lifestyles, it is tough to make time to relax the body and mind. And yet, taking the occasional break is necessary, whether in the form of a long vacation, or a relaxing 60 minute massage. We understand this need that most men feel, but rarely get the time to address. Which is why we crafted our unique Massage at Home service for men - a relaxing and therapeutic massage by an experienced massage therapist, served to you in your home. Research has shown that a simple 30 minute head and shoulder massage immediately relaxes the brain and calms the nerves. Do we suffer from any kind of body ache? A monthly massage relieves all kinds of body aches. If you suffer from pain, particularly your lower back or shoulders, a medium-pressure Thai massage or a deep-pressure Deep Tissue massage would offer relief. You should add massage therapy to your fitness plan. This increased flexibility makes regular exercise easier, and even more impactful. A massage reduces the strain, soreness, and tension in the muscles. Do you face trouble sleeping? Get a a light-pressure aromatherapy massage and see the results almost immediately! You will find your sleeping pattern improve when you book a good massage regularly. You sleep will be deep and uninterrupted, and you will wake up feeling refreshed and active. Do you fall sick often? A regular massage can help boost immunity. A 45 minute Swedish massage improves the protein levels in the blood, that in turn, help fight disease - causing pathogens. The list goes on, but most importantly we feel anyone who has a hectic lifestyle could use some me-time and there's no better way to boost the mood than a 60 minute indulgent massage that helps relax, de-stress and unwind! What is exactly is an UrbanClap Massage at Home for Men service? UrbanClap's Massage at Home offers men a relaxing head, shoulder, or a full body massage in the comfort and convenience of their home, at a time and day of their choosing. Our well-trained and experienced, male therapists arrive on time, are well-equipped, use high quality products, are mindful of hygiene and clean up after the service, all for an affordable price! Once your booking has been confirmed, a male massage therapist will reach your house on the date and time you have selected. He will be carrying a complete spa and massage kit and a full size, portable massage bed, for the massage therapy. However, you can opt to take the massage on your own bed since our therapist will also be carrying disposable sheets and towels. You can than pick an oil for your massage from a range of healing natural oils. Our therapist can advice you on the same. He will also ask you for specific pain areas on your body, to concentrate on, or if there any injury areas he should avoid. Once the massage is done, our therapist will clean up and tidy the place, before leaving your house. Spa menus can be baffling for almost anyone who isn’t too familiar with spa services. How different is a Balinese massage difference from a Thai - aren’t there from the same side of the world? Swedish Massage for Full Body: The Swedish/Classic is a light massage therapy recommended to first-timers. A therapist uses simple techniques or movements like sliding, kneading, rhythmic tapping, friction and shaking. Swedish massage is beneficial to people seeking pain relief. Deep Tissue Massage for Full Body: A Deep Tissue massage relieves chronic muscle pain. It stimulates the blood flow to help reduce inflammation causing the pain. A Deep Tissue massage also heals scar tissues or post-injury scarring at the muscular level which causes difficulty in movement. And, it certainly eject the stress out of the system! Foot Reflexology: While reflexology can be done to any of the limbs, it is most commonly applied to the feet. Reflexology makes use of pressure application to specific points on the feet, to reduce pain in any part of the body. Now whether for pain relief or relaxation, who can resist a good foot massage! Head, Neck and shoulder massage: A simple 50-minute head, neck, and shoulder massage is great way to ease the stiffness in the muscles. This is a great pick for anyone with a sedentary lifestyle, and spends long hours at a desk. Why choose UrbanClap's Massage at Home Service? Trusted Service Providers: UrbanClap has stringent criteria that include vetting and training that all professionals need to meet to be registered with us as service providers for full body massage for women in Delhi. As such, you can trust the spa professional you hire from UrbanClap. Your safety is not compromised and you can relax while availing the spa for home services for Thai Massage or any other massage. Even therapists for foot reflexology are trusted and verified. On time service delivery: We know how important your time is, and so we make sure that our therapists reach your home on time, give their complete attention for the entire duration of the service, and leave as soon as the service is done. Well-trained and experienced Massage Therapists: Any kind of massage requires the right technique to provide the stated benefits of the massage. All our massage therapists are well-trained and have a minimum of 2 years of experience of working in the best spas. They go through a thorough background-verification process before allowing to serve you. High Quality Products and Portable Spa Bed: We bring the complete spa experience at home. Our therapists carry a full-size spa bed bring candles, aromatherapy oils and play soothing music to create a spa-like ambience. Hygiene and post-service cleanup: We pay utmost attention to hygiene and cleanliness. The sheets and towels provided are disposable and for single-use only. Our therapists also clean up after the service is done.